Are you in a highly competitive real estate market? If so, hundreds or thousands of REALTORS® can be competing for the same listings, so whether you’re just starting out or have a website presence already, you need to stand out! The La Jolla real estate website design includes all the functionality needed in a real estate WordPress theme, and more! This incredibly unique and polished design will show the world you’re not just another agent. Perfect for real estate boutiques, single agents or teams, this imaginative theme will show off your creative side with its bold imagery and artistic design. 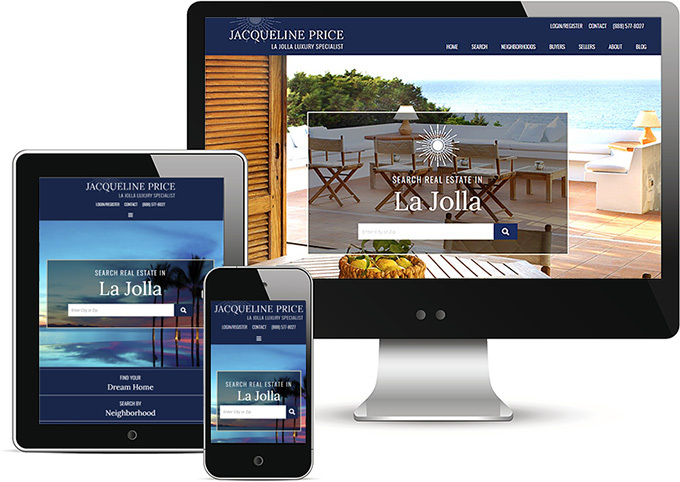 The La Jolla theme is predicted to be one of the best real estate website designs of 2018! Opening with three large rotating banner photos, the La Jolla catches your attention immediately. Leads looking to start their home search right away can easily do so via the homepage search, or browse the navigation bar for more options. Four customizable call to action buttons direct leads to the most important areas of the site (great for lead capture!) while maintaining a user-friendly experience. Beneath the buttons is a captivating agent profile area, perfect for introducing leads to your services. This area stands out from your typical real estate WordPress theme, the watercolor filter used here gives it a unique, artistic touch. Testimonials and ample branding wrap up the website, creating a polished and imaginative theme. The structure is fluid regardless of how you’re viewing the site (desktop, tablet, mobile) and is fully responsive. View the La Jolla theme on your phone and you’ll instantly see how easy it is to navigate. Need something custom? We’ll make sure it looks amazing on every screensize! The design and front-end functionality of a theme is only the beginning when it comes to designing WordPress real estate websites. You need a way to easily manage and update content and with our semi-custom sites like the La Jolla, we have you covered! All of our sites come with our original WordPress real estate add-ons, including an Agent Roster, Testimonials, Featured Listings, and Neighborhood Profile pages. With built in photo galleries and stunning internal side bars (with customizable call to action buttons), you’ll want to utilize your website to the fullest extent and routinely add content for search engine optimization. We also include a number of premium plugins, and you can expand on that by adding your own! Are you looking for a choice of stunning WordPress real estate themes with the IDX solution integrated right in? We have you covered. The La Jolla demo features iHomefinder Optima IDX which is just one of two IDX solutions you can choose from. We also offer IDX Broker’s great Lite or Platinum IDX solutions. Regardless of your IDX preference, the theme will include branded integration with hand-crafted IDX layouts refined to offer a seamless and professional search experience for leads, and a strong lead management system for REALTORS®. We can help you decide which IDX will be better for your site and make a recommendation. With MarketBoost your IDX can be more than just a search on your site. MarketBoost beats Zillow with the latest sold data your clients seek and offer for your clients to sign up for automated market reports. Another great drip market feature built into your IDX. Contact us to learn more. All websites include live training for groups and individuals, rest easy knowing you’ll be supported along the way and we’ll be here to help you succeed. We offer WordPress Care Plans to help you choose the right level of service for your site, and our support team is available via email and phone. Our customer service is top-notch and your website is more than just a business card, it’s an investment and an important tool we can help you utilize! How Can You Get the La Jolla Theme? Give us a call or send us an email and our sales representative will be in touch with the answers to your questions about the La Jolla and all of our website options. Whether you know exactly what you want or need to spend some time researching and reviewing your goals, our team is eager to help! We can make recommendations and answer your questions whenever you’re ready.